Trades must be entered between 8am New York time Wednesday to 5pm Tokyo time Thursday. Short entry following a bearish price action reversal on the H1 time frame immediately upon the next touch of 111.46. Long entry following a bullish price action reversal on the H1 time frame immediately upon the next touch of 110.27. I wrote yesterday that the picture was still bullish, we have seen a steady rise in this pair over the past 20 days or so, admittedly mostly on relatively low volatility. I remained cautiously bullish if the support at 110.52 could hold and the price could break to new highs above 110.65. The support at 110.52 did not hold, but the price bounced back quietly to me a new high above 110.65. At the time of writing, the price seems to be flattening out after making a new high a couple of hours ago. There is a clear bullish medium-term trend here which is partially driven by the positive correlation this pair often shows with a rising U.S. stock market. The problem is that the volatility of the current movement is relatively low, which implies unreliability. However, the price is holding above 110.00 and there I plenty of room to rise before meeting any key resistance, so I still have a cautiously bullish bias if the price can make new highs in the early part of the New York session. 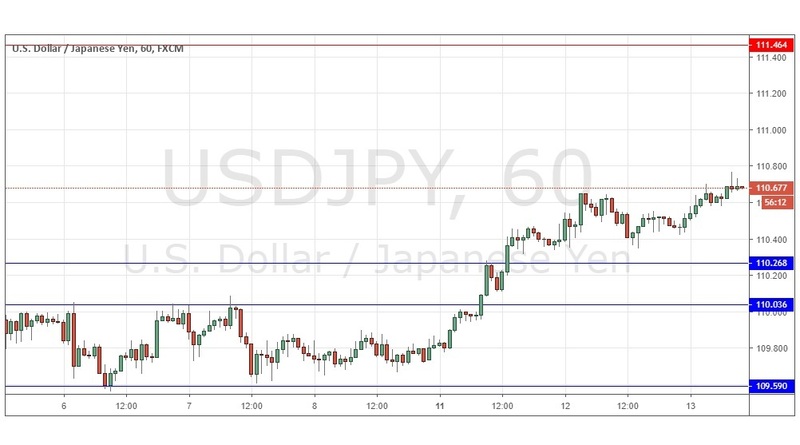 There is nothing of high importance due today regarding the JPY. Concerning the USD, there will be a release of CPI data at 1:30pm London time.